RoyTheArtist and Friends: Large Watercolour Lake district - Sash Brush! 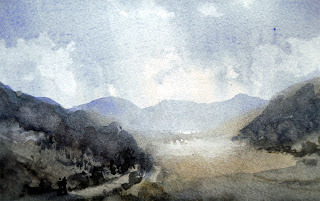 Large Watercolour Lake district - Sash Brush! Yes I've done another painting using rough brushes, I feel a series coming on! The paper size is 11 x 15 inches, which is much larger than I normally use, but I can see the advantages in painting watercolor with a large brush, on a largish paper.